Seth Shostak is a Senior Astronomer with the SETI Institute. He hosts the Big Picture Science Radio Show and writes articles and books on the search for extraterrestrial life. He contributed this article to Space.com's Expert Voices: Op-Ed & Insights. It's the brass ring that teams of astronomers from far and wide have tried to grab: Discovering a planet that sports an environment similar to our own. Finding Earth's cousin. And now, a team of researchers may have done it. This should give you something to gabble about at your next dinner soiree because, despite how much you treasure your home world — how much you cherish its postcard vistas and remarkable biota — we now have good reason to say, "special yes, unique no." Other planets might be just as livable as ours. The newly discovered world, imaginatively named Kepler-186f, is very nearly Earth-size — perhaps 10 percent larger. It's also in a wide orbit, at least compared to its four siblings, with a "year" that lasts 130 days. You can work out what that means if you did well in your sophomore astronomy course. But in case you didn't, here's the bottom line. Assuming there's an atmosphere swaddling Kepler-186f, then the surface temperatures would generally be above freezing and below boiling. There could be liquid oceans. And liquid water is any astrobiologist's favorite tipoff that life might be present. But wait a minute: Haven't we already found tons of worlds around other stars? Indeed, we have. Unless you've been comatose since birth, you're aware that planet discoveries are frequently in the news. But that situation is relatively new. Serious experiments to find worlds around other suns were attempted as early as the 1940s, but these efforts were akin to wildcatting in Texas: a downbeat story of many dry wells. Then in 1995, two Swiss astronomers who weren't even hunting for planets, tripped across a hulking world orbiting the relatively nearby star 51 Pegasi. That discovery let loose a gusher, and recent results from the NASA Kepler telescope have brought the tally of known and confirmed exoplanets to nearly 1,800. That's a lot of planet pleasure. But having a lot of planets is like having a lot of recipes. What you really care about are the best ones. And while there are roughly 20 exoplanets found so far in what's called the "habitable zone" of their home star — the orbital range where they're neither too hot nor too cold for liquid water — they aren't necessarily earthly relatives. Most are substantially bigger than our planet, and are called Super Earths. Alas, Super Earths might not be so super for biology. While no one knows for sure, planets that are more than 50 percent larger than ours might not be of the solid, rocky type that we figure is best for complex life. They might be stormy gas balls, like Jupiter and Saturn. 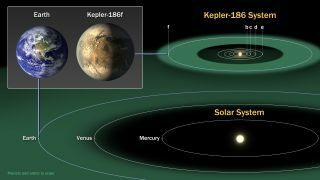 "Kepler-186f is the first definitive Earth-sized planet in the habitable zone around any star," explains Elisa Quintana, the first author on the paper announcing the discovery, and a colleague of mine here at the SETI Institute. Thomas Barclay, one of Quintana's co-authors, adds that "it's almost impossible for this not to be a solid planet. So now we know four rocky worlds with periods of hundreds of days: Venus, Earth, Mars, and … Kepler 186f." OK, so as a lottery ticket that might deliver on the big payoff — a life-bearing world — how good is Kepler-186f? Can we swing some other telescopes in its direction and actually verify that it has an atmosphere, maybe loaded up with water vapor? Quintana is doubtful. "This star is too dim for follow-up surveys, even with large next-generation telescopes. But it does show you can form Earth-size planets in the habitable zone." Of course, at nearly 500 light-years, we're not about to fire up our rockets and send explorers to check out whatever fauna and flora might be crusting the surface of Kepler-186f. But you can bet that as soon as possible, astronomers will try to find other, closer siblings to this world, and examine them for the spectral signatures of life. And meanwhile, the SETI Institute is continuing its radio reconnaissance of Kepler-186f, examining a wide swath of microwave frequencies looking for alien transmissions. So far, the inhabitants — if there are any — are mum. Nonetheless, finding Kepler-186f has already been a trail-blazing event. It's a proof of concept, a discovery of the tip of (possibly) a very big iceberg. And this much is for sure: This planet will forever be inscribed in the history books as the first world discovered beyond our own where we — and possibly other living things — might feel comfortable.